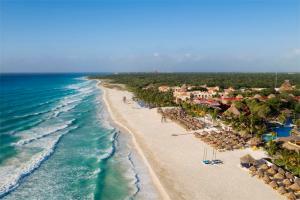 Situated right on the beach, this all-inclusive hotel combines traditional culture with luxury. Enjoy the best sandy beaches and clear waters, take a nap in the shade of a palapa, relax at the Sensations Spa, and enjoy a variety of sporting activities for everyone. The 350 rooms, including 24 junior suites and 2 presidential suites feature flat-screen TVs, WiFi and more, plus many offer balconies and views of the garden, jungle, or ocean. Located only 5 minutes away from downtown Playa del Carmen.